The purpose of this project is to explore the concept of crowd collaboration, and how it can occur in the context of navigational controls in an embodied manner. 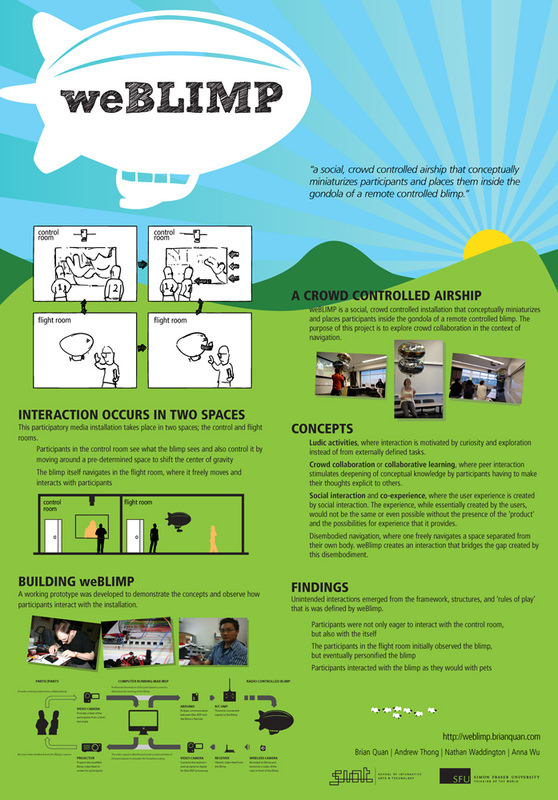 The project attempts to bridge the gap caused by the disembodied relationship between the remote control and the Blimp. Rather than use conventional navigation controls like joysticks that are often manipulated by a single driver, we want to allow each “passenger” to have a say in how the Blimp is navigated. The goal: creating an innovative, participative media installation for large audiences, by combining group navigation, social experience, and significant individual interaction. In February 2010, weBlimp will be featured installation as a part of the 2010 Winter Olympics! Quan, B., Thong, A., Waddington, N., Wu, A. "weBlimp", ACM Creativity and Cognition 2009 Conference, October 27-30, 2009, Berkeley, CA. Poster session.